Although The Night Owl is a relative newcomer, we have already made our mark on the UK soul scene and been voted Best New Venue by the Birmingham Mail readers last year. 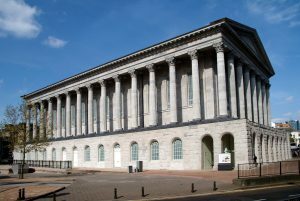 Town Hall is one of the city’s most renowned and prestigious music venues, and the two venues have joined forces to work together to bring The Big Birmingham Soul Night this April. The event, which harks back to soul nights of the 60’s and 70’s, will be programmed by The Night Owl and held at Birmingham Town Hall. This beautiful listed building boasts a giant wooden floor, perfect for Northern Soul and Mod style dancing, with an elegant balcony for those who would prefer to just relax and enjoy the dancing below. There will also a smaller second room of music, with its own bar and seating, record buying and selling and more. Confirmed to head up this evening is legendary DJ Colin Curtis, who began DJing in the late 1960’s at the Crystal Lake Ballroom and the infamous Golden Torch in Stoke and later Blackpool Mecca. He is often cited as being one of the most important taste-makers of black music in the UK. Colin will be playing music from his Torch days, so you can expect the Northern Soul classics that Colin broke and much more, all on original vinyl.